A day after an embarrassing loss to their arch rivals, the Buffalo Bandits roared out of the gate and trampled the New England Black Wolves 15-5 at Mohegan Sun Arena on Sunday afternoon. Saturday night’s loss in Rochester and a long travel day to Connecticut (two hours from Boston’s airport to Uncasville) were just blips in the radar as the Bandits had the only lead they would need 5:33 into the game. Dhane Smith and Callum Crawford traded goals in the first two minutes but a power play goal from Corey Small and a shorthanded goal from Thomas Hoggarth scored underhand from the restraining line gave the Bandits a 3-1 lead after the first. New England showed some fight early in the second quarter, scoring two goals to Buffalo’s three to close the gap slightly. But a three-goal run from the Bandits saw them suddenly lead by six. Small scored two of those, one on a power play and the other coming on a pass from Shawn Evans who had been checked down to the floor by Greg Downing and Colton Watkinson. Despite taking both a high stick and a check to the head, Evans found Small on Doug Jamieson’s doorstop with a backhand pass from the ground. Jamieson was lifted in favour of Alexis Buque after a one-armed goal from a tied-up Chase Fraser made it 9-3 at the half. 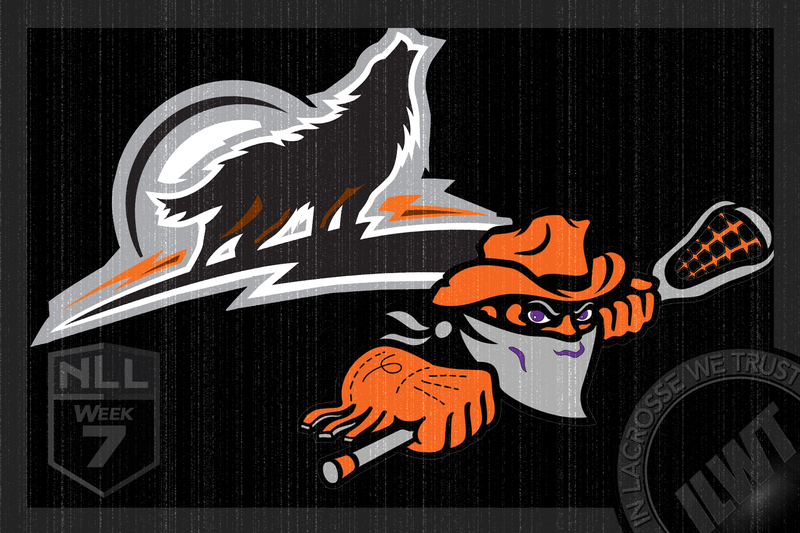 The Bandits outscored the Black Wolves 4-0 in the third. Each team tallied twice in the final frame but the Bandits ended up on top with the 10-goal differential. Four Bandits had big games: Corey Small (4G/3A), Dhane Smith (2G/9A), Thomas Hoggarth (3G/2A) and Chase Fraser (3G/2A). Held scoreless, Shawn Evans still contributed in his favorite category and picked up six assists. Callum Crawford three of New England’s goals. JP Kealey and Colton Watkinson had the others. The Bandits host the Colorado Mammoth this coming Saturday, while the Black Wolves are on the road this Friday to face the Georgia Swarm.